Curcumin is a pharmacological and nutritional phytochemical present in the rhizomes of Curcuma longa. For high extraction yield, sonication is the most efficient technique. Ultrasonic extraction results in high quality, high yield and requires only short processing time. 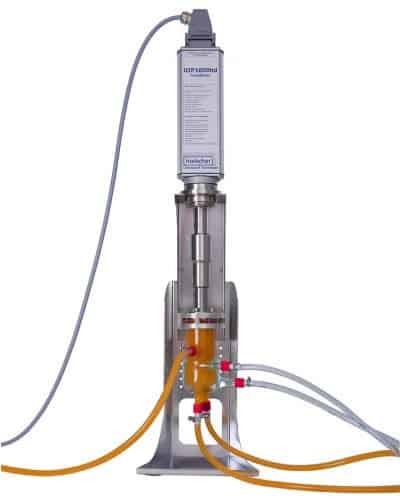 Ultrasonic extraction is an highly efficient alternative to conventional extraction techniques such as maceration, hot solvent extraction or Soxhlet extraction. 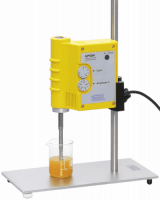 Ultrasonic isolation of curcumin und curcuminoids from the curcuma plant (e.g. Curcuma longa, Curcuma amada) is an efficient, rapid and easy process. In comparison with Soxhlet extraction and conventional batch extraction, ultrasonically assisted extraction excels with a significantly increased curcumin yield in a shorter extraction time. For the ultrasonic extraction of phytoconstituents, various solvents can be used such as water, aqueous solvents, ethanol, methanol, glycerin etc. For the extraction of curcumin, water, ethanol and triacylglycerols are effective and safe solvents, which result in a high yield of extract. 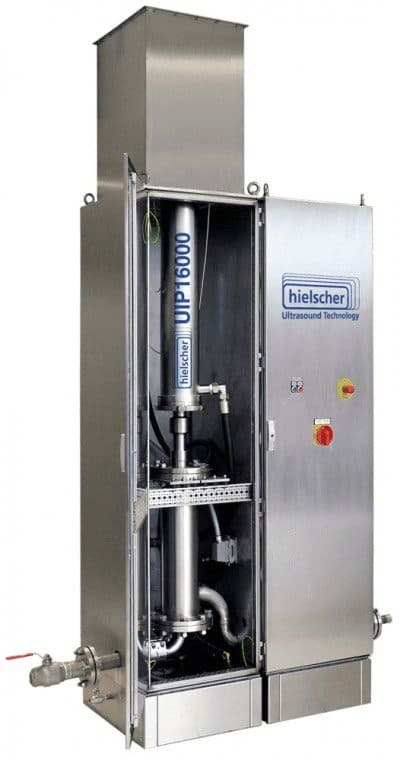 Hielscher’s state-of-the-art ultrasonic equipment allows for full control over the process parameters such as amplitude, temperature, pressure and energy input. For ultrasonic extraction, peripheral parameters such as raw material particle size, solvent type, solid-to-solvent ratio, and extraction time can be easily varied and optimized for best results. Since ultrasonic extraction is a non-thermal extraction method, the thermal degradation of the bioactive ingredients is avoided. Overall, advantages such as high yield, short extraction time, low extraction temperature, and the small amounts of solvent makes sonication the superior extraction method. Ultrasonic extraction of curcumin from turmeric has been found to be most efficient when sonication was applied in a continuous inline setup, using an ultrasonic flow cell. Process temperatures temperature in the range of 60 to 80°C are beneficial to enhance the extract yield. Superior process effciency: Ultrasonic extraction excels as a sustainable technique which requires only a moderate investment of ultrasound equipment. The ultrasonic process can be linearly scaled-up to industrial production. Costs for solvent and energy for the ultrasonic process are very low. Further important advantages are the easy and safe operation, economical costs and the reproducibility, which is crucial for a standardized production. Curcumin is a hydrophobic, fat-soluble molecule. This means curcumin must be formulated into a drug carrier system such as liposomes, nanoemulsions, nanospheres, polymeric nanoparticles, or phyto-phospholipid complex. 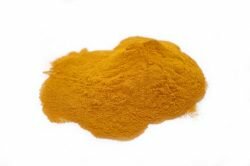 Aqueous curcumin solutions can be prepared by adding surfactants, lipids, albumins, cyclodextrins, biopolymers etc. 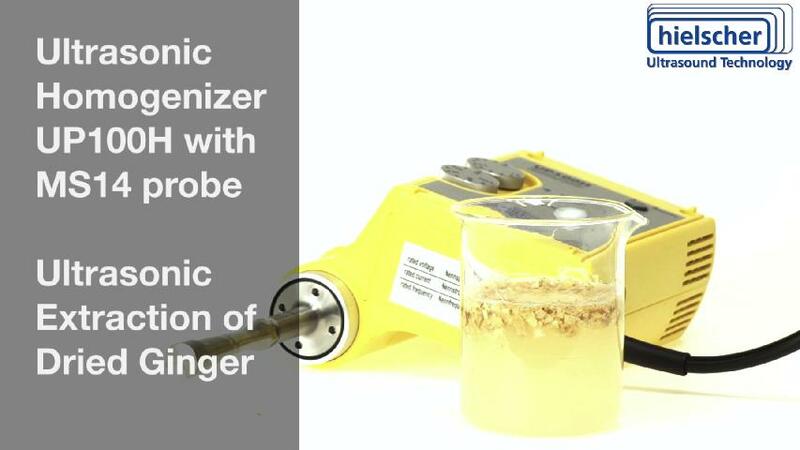 Ultrasonic preparation of nanoemulsions and uniform suspensions is a very effective technique to formulate curcumin into drug carrier complexes. Drug carriers enhance the solubility, absorption, pharmacokinetics, and bioavailability of curcumin. By formulating curcumin into nano-complexes, the water-solubility is enhanced approx. 98000-fold (compared to free curcumin in water). The nanocomplexation considerably improved the the bioavailability and the storage stability of curcumin. Click here to learn more about the ultrasonic encapsulation in liposomes! Hielscher Ultrasonics is your partner for extraction processes from botanicals. Whether you want extract small amounts for research and analysis or process large volumes for commercial production, we have the suitable ultrasonic extractor for you. Our ultrasonic lab homogenizers as well as our bench-top and industrial ultrasonicators are robust, easy-to-use and built for 24/7 operation under full load. 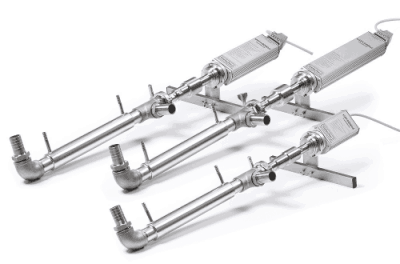 A broad range of accessories such as sonotrodes (ultrasonic probes / horns) with different sizes and shapes, flow cells and reactors and boosters allow for the optimal setup for you specific extraction process. All digital ultrasonic machines are equipped with a colored touch display, integrated SD Card for automatic data protocolling, and browser remote control for comprehensive process monitoring. With Hielscher’s sophisticated ultrasonic systems, high process standardization and quality control is made simple. Contact us today to discuss the requirements of your extraction process! We will be glad to assist you with our long-term experience in botanical extractions! Curcumin loaded nanoparticles are synthesized using the miniemulsification-evaporation technique. The procedure varies depending on the encapsulant used as described below. The formulation used was 22.400g water, 0.180g lecithin, 11.500g dichloromethane, and 0.390g encapsulant (Poly(L-lactic acid) PLLA, 4,000g/gmol or poly(methacylic acid-co-methyl methacrylate Eudragit S100, 125,000 g/gmol or a mixture of them are used as encapsulant). No co-stabilizer is required since it is known that preformed polymers are effective in preventing emulsion degradation by diffusion. When PLLA is used as encapsulant, PLLA and lecithin were dissolved in dichloromethane for 10 minutes and, after this, curcumin is added and mixed for 5 min (1, 3, 6, 18 wt% of the total encapsulant mass). This solution was added to the distilled water under gentle stirring. The macroemulsion formed is sonicated with an ultrasonic homogenizer such as UP100H for 180 seconds in pulse cycles (30sec sonication, 10sec pause). Afterwards, the solvent is evaporated for 18 hours at 40°C. When PLLA and Eudragit S100 together were used as encapsulant, Eudragit S100 is dissolved in dichloromethane at 60°C for 20 minutes. After this, the mixture was cooled and the evaporated solvent was added again. Chen, F.-P. et al. (2015): Nanocomplexation between Curcumin and Soy Protein Isolate: Influence on Curcumin Stability/Bioaccessibility and in Vitro Protein Digestibility. J. Agric. Food Chem. 63, 2015. 3559−3569. Kimthet, Ch. et al. (2017): Extraction of curcumin from Curcuma longa L. using ultrasound assisted supercritical carbon dioxide. AIP Conference Proceedings 184, 2017. Poonkuil, N.L. ; Raja, J.D. (2017): Drying Effects on Ultrasonic Assisted Phenolic Yields and Retentiveness of Antiradical Properties of Common Culinary Spices Ginger (Zingiber officinale) and Turmeric (Curcuma longo): HPTLC and GC – MS Profile for their Active Ingredients Assement. International Journal of Research – Granthaalayah 5, 2017. 7-23. Priyadarsini, K.I. (2014): The Chemistry of Curcumin: From Extraction to Therapeutic Agent. Molecules, 19, 2014. 20091-20112. Silva-Buzanello, R. A. da et al. (2016): Preparation of curcumin-loaded nanoparticles and determination of the antioxidant potential of curcumin after encapsulation. Polímeros vol.26, n.3, 2016. 207-214. Ultrasonically assisted extraction is based on the principle of acoustic cavitation. When high power ultrasound (low frequency, high intensity US) is coupled into a liquid or paste-like medium, the waves create alternating high-pressure (compression) and low-pressure (rarefaction) cycles. During these high-pressure / low-pressure cycles, vacuum bubbles occur and grow over various cycles. At the point when the bubbles cannot absorb more energy, they implode violently. This bubble implosion and its effects are known as acoustic cavitation. Cavitation generates microjets, shear forces, shockwaves / high pressure differentials, radical formation, extreme temperatures and acoustic streaming. These intense conditions break cell walls and high mass transfer so that the intracellular material is transferred into the solvent. Herbal extracts which are used fot medicinal and nutricional purpose are getting a fastly growing interest as pharmacological remedies and as nutritional supplements (nutraceuticals). In order to release the desired compounds from rhe plant material, it must be dissolved within a solvent. When the targeted extracts are removed from the the bulk of the plant material and transferred into the solvent, the extract can be concentrated. Ultrasonic extraction can be applied as solvent-free methodolgy using water as solvent. Alcohol and glycerin extractions are both non-toxic and effective too, which are often used for the extraction of food, pharma and cosmetic ingredients. In regards to the production of highly potent, healthy, non-toxic extracts, it is an important to use an efficient extraction method, which allows for the use of mild, non-toxic solvents such as water, triacylglycerols or alcohol. Click here to read more about the solvents used in ultrasonic extraction processes! Curcumin is a turmeric oleoresin and natural pigment found in the rhizomes of the tumeric plant. Other important curcuminoid compounds are demethoxycurcumin (DMC) and bisdemethoxycurcumin (BDMC). Curcumin (chemical formula C21H20O6) can be extracted from Curcuma longa, Curcuma amada, Curcuma ochrorhiza Val. or synthesized chemically. Curcumin is captured in polysaccharide-lignin network in turmeric. Therefore, a powerful extraction technique such as sonication is required to break the cell walls so that the bioactive phytochemical is released. Studies have shown that the active compound piperine, which is found in black pepper, increases the bioavailability of curcumin by over 2,000%. Turmeric (Curcuma longa) is a herbaceous perennial plant of tge ginger family Zingiberaceae. It is native to India and Southeast Asia. The rhizomes of the turmeric plant are harvested to be used as spice and medicine. Turmeric is the spice that gives curry its intense yellow color and has been used in India for thousands of years as culinary spice as well as ayurvedic medicine. Turmeric powder is characterized by a warm, bitter, pepper-like flavor and earthy aroma. Turmeric powder or paste is used to prepare a popular hot drink – the so called “turmeric latte” or “golden milk” – which is prepared with milk or non-dairy milk alternatives, such as soy, almond or coconut milk. Turmeric is valued for its antioxidative, anti-inflammatory and analgesic effects. Besides culinary and medicinal uses, turmeric is utilizes as natural dye.